Did you know that by 2021, it’s expected that video will make up 82% of all consumer internet traffic? By then the world will reach three trillion Internet video minutes per month, which is five million years of video per month, or about one million video minutes every second. These staggering predictions from Cisco’s Visual Networking Index should be a wake-up call for digital marketers who haven’t considered a YouTube ad campaign as part of their Google Ads strategy. Perhaps you’ve held back YouTube until now because you feel that your audience doesn’t consume video content? 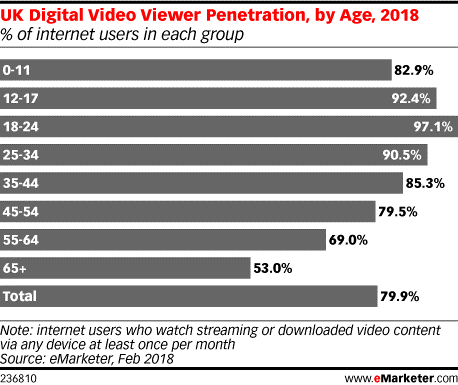 You might then be surprised to find that according to research from eMarketer, internet users of all ages are actively streaming or downloading video content. Consider then that many of those users are also on YouTube which is currently racking up 1.9 billion monthly logged in viewers. On average, those users are watching over 1 hour of YouTube content per day on mobile alone. 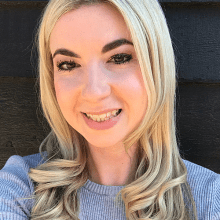 Of course there are now plenty of video ad opportunities on offer by the likes of Facebook, Instagram, Twitter and LinkedIn. What sets YouTube apart from the competition however is that it’s a platform dedicated to consuming video content. On Facebook for example, there’s a mixture of content in your news feed in the form of text, photos, web links and videos. Taking my personal usage as an example, there’s a good chance that FB users are swiping through hundreds of memes, baby announcements and holiday photos, all vying for their attention. When I go to YouTube however, I’ve made an active decision to consume one kind of content and I’m therefore more likely to pay attention to a video ad there. But don’t just take my word for it, there are some compelling stats to emphasise just how much more engaging YouTube ads are. Users are 2x more likely to pay attention to ads on YouTube vs. social media. Users are 3x more likely to pay attention to online video ads vs. TV. 95% of ads on YouTube are viewable, and 95% are watched with sound on. 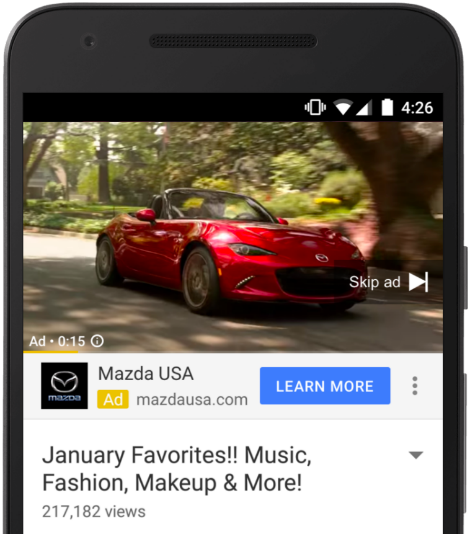 In the past 12 months there has been a +150% YoY growth of conversions from YouTube Ads. When it comes to YouTube Ads, there are a number of formats on offer which are suited to a range of business goals. Mastheads – a high-impact (and high-cost) brand awareness ad that sits on the YouTube homepage (try it out here!). The budget requirements are rather high given the wide exposure it grants and it’s typically used by brands with big awareness goals and even bigger wallets. Bumpers – a short and sweet, 6 second ad that’s perfect for remarketing or well-known brands. Due to the limited amount of time on offer, you’ve got to be reaching an audience that’s already somewhat engaged with your brand here. 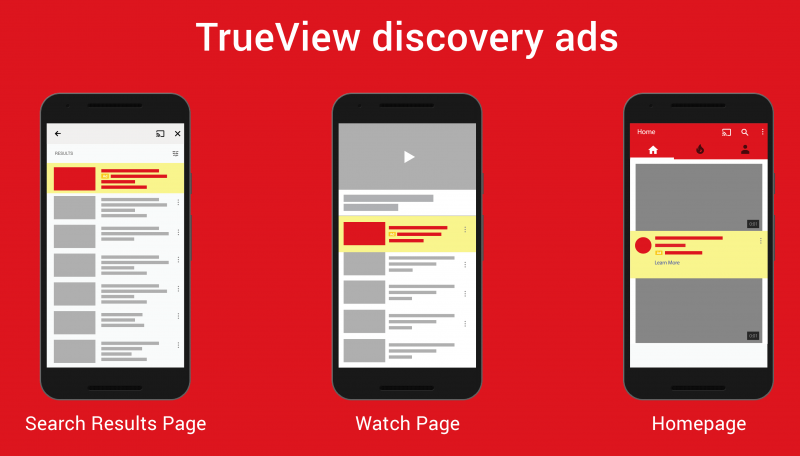 Trueview Discovery – consisting of an image and up to three lines of text, these ads can appear in search results, on a watch page or homepage. They’re good for trying to drive video views and if using a CPC model with this ad type, you can effectively get free brand awareness if nobody clicks. TrueView In-Stream – probably the most commonly found YouTube ad, these are the ones that pop up when you are mid-stream and can be skipped after 5 seconds. This format is a good choice for video views and also for driving clicks through to your website if you use CTA overlays. Make sure you add a custom companion banner image for brand awareness and additional clicks after your ad has played! TrueView For Action – the latest and (in our opinion) greatest ad yet. It takes the features of the In-Stream format and evolves them by allowing you to include an ad strip underneath the video window. This strip allows for a logo, headline and customisable CTA button. 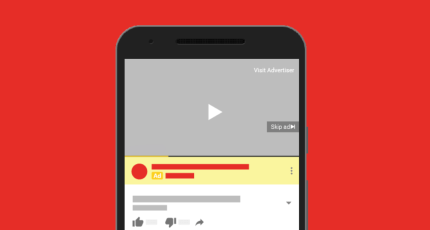 We’ve seen great results for our clients using this new format with CTR’s much higher than other YouTube ads and in some cases, higher than traditional display. It’s also been a fantastic choice for driving conversions when you combine it with some of the new audience signals you can use with it. If your campaign goals are impressions and reach then we would recommend looking at the masthead, bumper or TrueView discovery or in-stream formats. However, if you’re looking at driving meaningful action, such as leads or traffic, then you should look to YouTube’s latest brainchild: TrueView for Action. When Google created TrueView for Action they also strengthened existing affinity and In-Market segments, with added signals from Google Search, Maps and Play. They’ve also added life events audiences so that you can reach people during major life milestones like getting married or moving. Consumer patterns audiences are another new addition which allow you to reach frequent shoppers, restaurant goers and more. Lastly and one of the most powerful new targeting options is custom intent audiences. These allow you to reach people based on their intent, with signals used in Google Search and more. As such, users who’ve searched for relevant terms in Google but never clicked through to your website can be reached on YouTube with this format. This is even more impressive when you consider that more than 55% of people search for a product on Google, and then learn more by going to YouTube before buying it. An internal YouTube study has shown that combining this new audience with TrueView for Action has shown a 30% increase in conversion rates compared to using other targeting methods. One of the most common barriers to creating a YouTube Ad campaign is also one of the most essential in getting good results out of it: the creative. I’ve had various scenarios where my clients have no assets at all or videos that require lots of editing in order to make a good fit for YouTube. Build for mobile first: use much tighter framing, bright footage and large text and graphics. This will mean that no matter what the screen size or brightness, your users will be able to clearly see what you’re advertising. Make use of sight and sound: again, this might seem obvious, but you need to keep people engaged and a great way of doing this is with interesting visuals and engaging sound. Faster pacing and cuts will also help here. Win in the first 5 seconds: this one is incredibly important as we want to dissuade users from skipping our ads and to do that, we need to win them over quickly. Start with a clear problem statement that resonates with your audience before moving on to offer your brand as the solution. If you’re still struggling to put together some creative then Google is on hand to help. If you have existing assets you can get in touch with your account representative and ask them to help recut and edit existing footage. Or if you’re starting from scratch you can contact YouTube-approved video production partners who can create the right video ad for you……for a price! In the very near future, the majority of your user’s time on the internet will be spent on online video. What are you doing to ensure you stay in touch with them? At Coast Digital, our experts have extensive experience with YouTube Ad campaigns and we’re ready to discuss how they can work for you today. Get in contact with us to find out more.